In a large bowl, combine the water, butter, and sugar. Sprinkle the yeast over the mixture and let stand 5 minutes or until foamy. Stir in the eggs, salt, and dry milk until combined. With a wooden spoon stir in 5 cups of the flour, 1 cup at a time, and stir the mixture until a dough is formed. On a floured surface, knead the dough for about 10 minutes, adding enough of the remaining 1 cup flour to make the dough smooth and elastic. Put the dough in a lightly oiled bowl, turn it to coat it with oil, and let it rise, covered with plastic wrap, in a warm place until doubled in bulk, about 1 hour. Punch down the dough. On a floured surface with a floured rolling pin, roll the dough into a 15-by-20-inch rectangle. Spread the ½ stick butter over the dough and sprinkle with the sugar, cinnamon, cardamom, and orange zest. With a long side of the dough facing you, roll up the dough jelly-roll fashion and cut crosswise into approximately 1½-inch-thick slices. Twist each slice to form a figure eight and crimp the ends together. 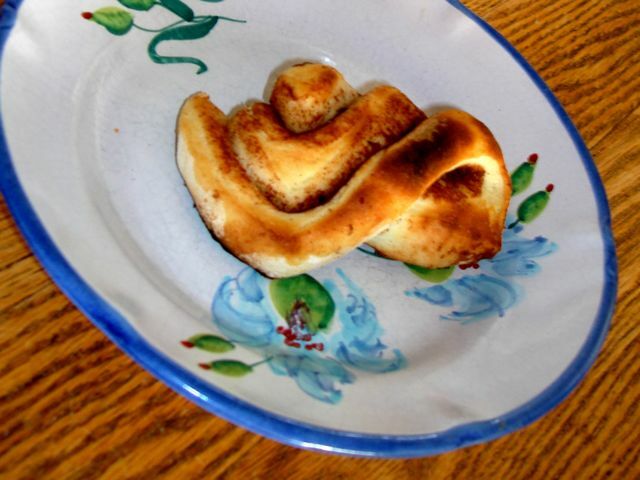 Arrange the rolls, a swirled side up, about 2 inches apart on a buttered baking sheet. Let rise in a warm place until increased 1½ times in bulk, about 1 hour. While the rolls are rising, preheat oven to 350 degrees. Combine the egg and water to make the egg wash. Brush the tops of the rolls with the wash and sprinkle with a little sugar. Bake the rolls in middle of the oven until the tops are pale golden, about 25 minutes.